James H. Mullen Jr. Arena Feb. 1, 2019. The final score was 80-68, Gator victory. 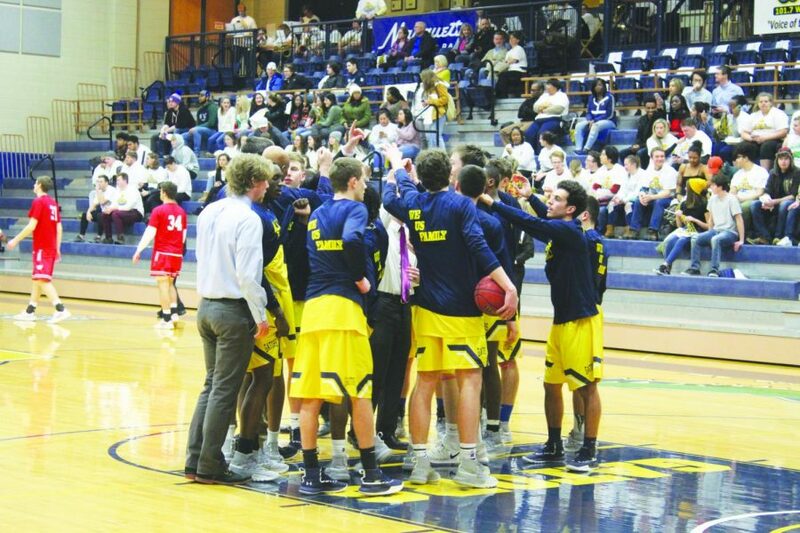 When Allegheny Men’s Basketball Head Coach Bob Simmons addressed visiting trustees ahead of the Gator’s Feb. 1 game against the Wabash Little Giants, he was frank about the challenge of facing a team ranked 14 in the nation for Division III men’s basketball. As far as he was concerned, he said, the Gators were No. 1. The Gators ranked 209 in the nation in the same ranking as of Jan. 9, 2019. 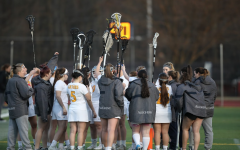 This 195-place difference did not prevent the Gators from securing a 12-point victory over the Little Giants at a home white-out game in the newly dedicated James H. Mullen Jr. Arena in the David V. Wise Center. The 80-68 win contributed to the Gators’ to an 8-12 overall record and a 4-10 conference record. In order to prepare, according to Simmons, the Gators focused on defensive strategy and their goal of staying close to Wabash’s high-scoring shooters. 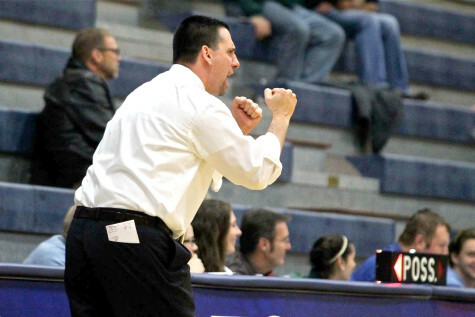 The Gators focused specifically on preventing the Little Giants from making three-point shots. 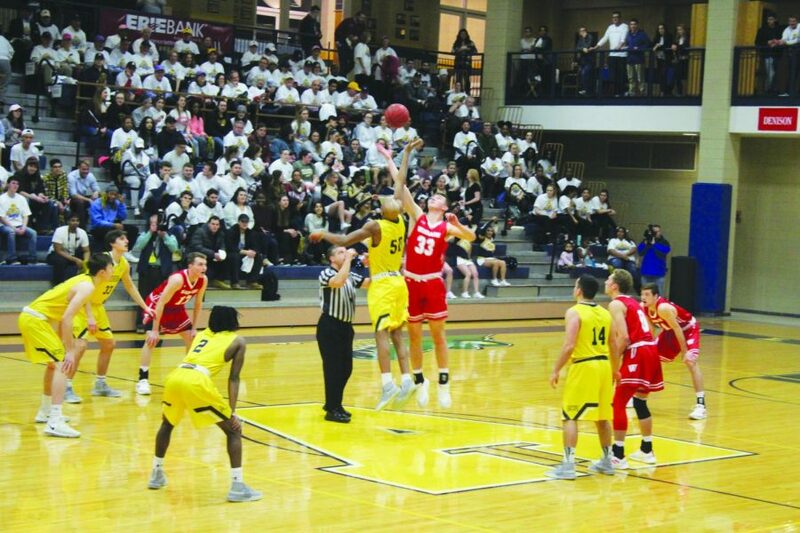 Allegheny held Wabash to decreases in their shooting statistics — Wabash’s 48 percent shooting average from the field dropped to 36 percent, and a 38 percent average from the three-point line dropped to 20 percent against the Gators. Center’s James H. Mullen Jr. Arena Feb. 1, 2019. 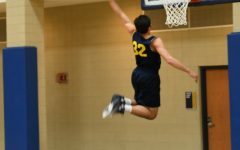 Guard Brian Roberts, ’22, attributed the exciting win to that game plan. “If we play defense, that’s the main thing,” Roberts said. He said that “the preparation from our coaches and the schedule that they had down for us so we could execute it properly” was key to securing victory. On the offensive side, Jordan Rawls, ’20, scored a team-best 22 points and was later named the NCAC Athlete of the Week. He was followed closely by Brian Roberts’s 20 points. The Gators scored the bulk of their points in the second half, trailing Wabash 37-32 at halftime before surging ahead with another 48 points in the second half. 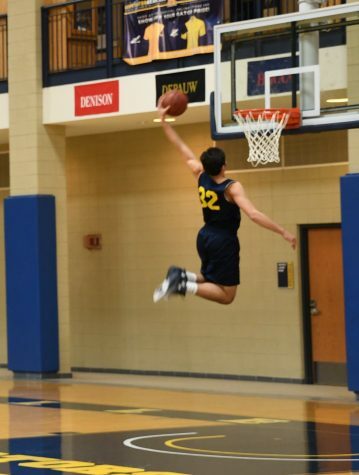 Guard Jordan Greynolds, ’22, credited the unique environment of the Feb. 1 home game, which combined the matchup with the surprise announcement of the renaming of the Gators’ home court in the Wise Center after Allegheny College President James Mullen. The opening of the game revealed the new arena name with a new scoring table. Mullen was also honored with a plaque to mark the spot where he has stood to watch sporting events — numerous sporting events, according to Greynolds. “He comes to every sporting event, all of it,” Greynolds said. The environment created by the athletic department and campus community honoring Mullen’s commitment made the win especially meaningful for Roberts. The reaction of spectators and athletes alike testified to just how special that moment was, Simmons said. That “fantastic environment” is one of the elements of the Wabash game Simmons hopes to see throughout the rest of the season. Roberts said he and his teammates are hoping to make the season particularly special by achieving a goal they’ve had in mind for months. “I feel like we can beat everybody,” Roberts said.